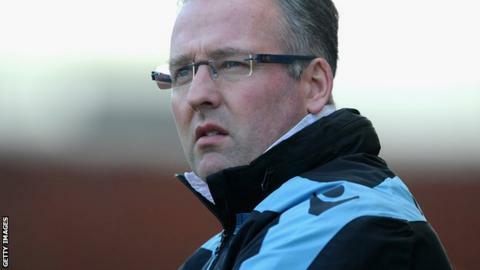 Aston Villa manager Paul Lambert has warned the club's fans not to expect any major signings in the summer. Villa secured their Premier League status for next season on Tuesday when Arsenal beat Wigan 4-1 to condemn the Latics to relegation. That means Lambert can start planning ahead, with a priority being sorting out striker Christian Benteke's future. But the Villa boss does not expect any big summer signings, saying: "Those days have gone." He added: "We have stripped it right back. We want players who are hungry. I look at players with character, not those who just want money." Lambert adopted a similar policy last summer, bringing in relatively inexperienced or unknown players, such as Ashley Westwood, Matt Lowton and Benteke, who have since gone on to impress in the Premier League. Benteke, 22, was signed from Belgian side Genk in August on a four-year contract and has scored 23 goals in 39 appearances. "Christian is one of a few who have been brilliant for us, collectively as a team and as individuals they've been great," added Lambert. "We're coming to the end of the season and we'll sit them down and try to get things done. "Every one of the players have helped us stay up, it's not just one player - they all contributed something."